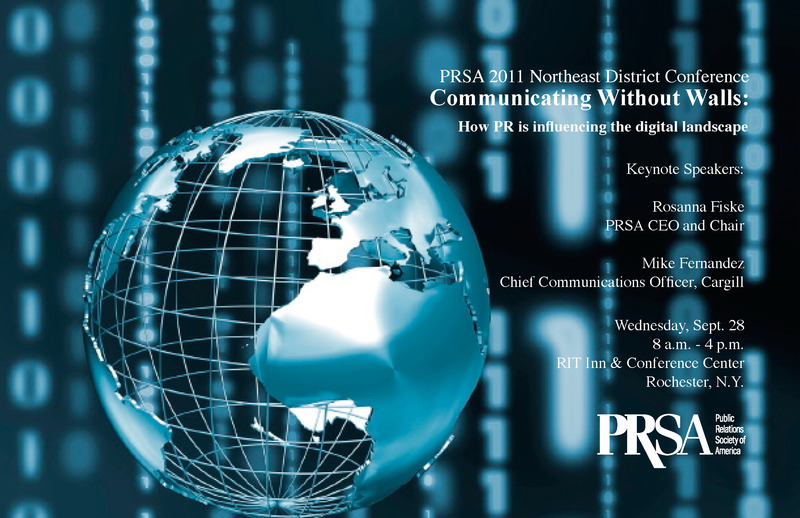 The Rochester chapter of the Public Relations Society of America (PRSA) will host the organization’s Northeast District Conference on Wednesday, September 28, at the RIT Inn and Conference Center. The theme of this year’s 2011 conference is “Communicating Without Walls,” and will feature a morning keynote presentation from Mike Fernandez, Vice President of Corporate Affairs at Cargill, and a lunch keynote from Rosanna Fiske, APR, CEO and Chair of PRSA. In addition, a total of 20 breakout sessions will take place throughout the day, and will be presented by public relations professionals from across the country. Some of the session topics include crisis communications, employee/internal communications, social media best practices, video marketing, social media and politics, and a media panel featuring local print, television, and radio journalists. Complete event and registration information can be found on the Rochester Chapter – Public Relations Society of America website. The chapter will also be posting information on their Facebook page and Twitter feed from now until the day of the event!